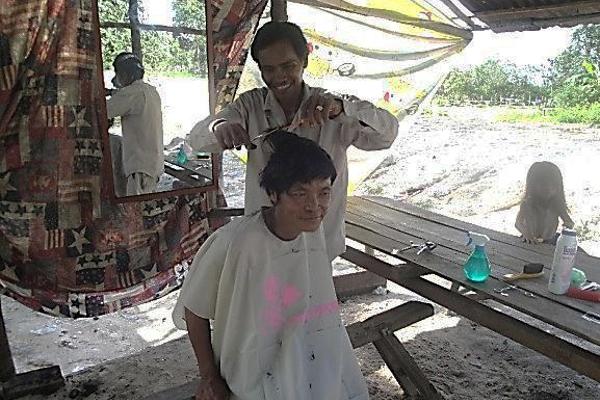 Kiri now runs a small barber shop, and says he enjoys a normal life again. Like many farmers in central Cambodia’s Kampong Chhang Province, Kiri struggled to feed his wife and child by growing rice. Yields were poor, and making a living became more difficult each year. Rumors of opportunity and a better life for those who migrated to the city of Poipet on the Thai border, became too great to resist. At 27, Kiri gave up his quiet life to relocate his family. Soon after arriving in Poipet in 2008, a broker presented Kiri with a more lucrative offer — a prosperous future working in a factory across the border in Thailand. Driven by the dream of earning greater income, Kiri agreed to go with the broker, leaving his family behind. That’s when his dream began to unravel. The broker took him to a house where he was kept captive for 10 days. Then he was taken by boat to Indonesia and sold as slave labor. He lived and worked for four years on a fishing boat, forced to toil long hours and with little food. He witnessed sick workers thrown into the sea and began to plot his escape. Luckily, through a crew member from another boat, he obtained the phone number for the police and took action. After numerous attempts he was successful in making contact. In 2013, he was rescued and repatriated back to Cambodia. In Cambodia, he was reunited with his family. Through the Cambodian Women’s Crisis Center, a Counter Trafficking in Persons program partner, Kiri received psychological counseling, career guidance and training. With project support, he developed a business plan and received a small business grant to buy the equipment necessary to set up a barber service. Since then his business has thrived and his life is returning to normal. “I have recovered my life thanks to the support of” the CTIP project, says Kiri.